Our 628 stands at Niedaltdorf, terminus (except for the day before!) of the service from Saarlouis and Dillingen. 14.4.01. What a day to be on an Airbus… Lift to BHX at 0510 courtesy of our [then] postman son, who seemed to be the only one even remotely awake (quiz league ‘end of term’ night last night was accompanied by Taylor’s Landlord). Uneventful and almost on time flight on an A319 to DUS where we arrived just after the flight from Istanbul, which led to a lo-o-o-ng queue for immigration. No sign of the baggage on the screens either, but we found it after enquiry and just made 1003 to Düsseldorf Hbf, though somewhat invalidly as the composteur wasn’t working. We remedied this at Dü-Hbf and set off on an S6 to Essen via Kettwig. From Essen we continued on to Hattingen Mitte, an underground station with a metre gauge tram terminus ‘upstairs’. Back to Essen Hbf and then on to S9 for Haltern - quite an interesting run, at least as far as Bottrop, as the line crosses over the main east-west freight route and associated connections. From there on it’s fairly mundane. A 10 minute turn round at Haltern, then a short run down to Wanne-Eickel Hbf where a further 10 minutes elapsed. The first diesel of the day was a two car low floor thing which trundled down to Bochum Hbf, ending up in P1 which is a bay at the northwest corner. Back on to electrics for an S1 to Dortmund via the quite separate S-Bahn route through Do-Kley and Do-Universität. At Dortmund Hbf there was time for a sandwich and a DAB Pils before going on to Hagen via Do-Tierpark on the Volmetallbahn. The station bar at Dortmund sports a picture of Ivatt 2-6-2T 41241. Why? At Hagen we had yet another 10 minute wait, for the S8 to Wuppertal-Oberbarmen via Gevelsberg, again a separate S-Bahn route. The Danglebahn was taken from W-Oberbarmen to W-Vohwinkel. A good deal of upgrading work was in evidence, particularly on the steelwork foundations. It being far too cold to stand around when we arrived at the Vohwinkel DB station, we dived on to an RE to Düsseldorf and thence another RE to Köln Hbf, having purchased a ticket from the VRR border to Köln Hbf, which was about DM15 for the two of us. We finally settled for 0920 Köln - Trier. It seems the tilting karts still don’t work as this was Rabbit powered and retimed to 1212 at Trier. Nice run on a beautiful morning, but I’d done it before and H was disappointed to miss the Mosel valley. At Trier the Kursbuch was back in charge with the next Saarbrücken at 1243 so I retired to the Zapfhahn and ordered up the beers while H procured some lunch. Off then to Dillingen to investigate possible bus option to enable us to regain the original plan. No such luck; bus leaves 1502, train arrives 1515. Nice run up the Saar valley to Dillingen though. Beyond there, serious heavy industry (Ford, steel etc.). 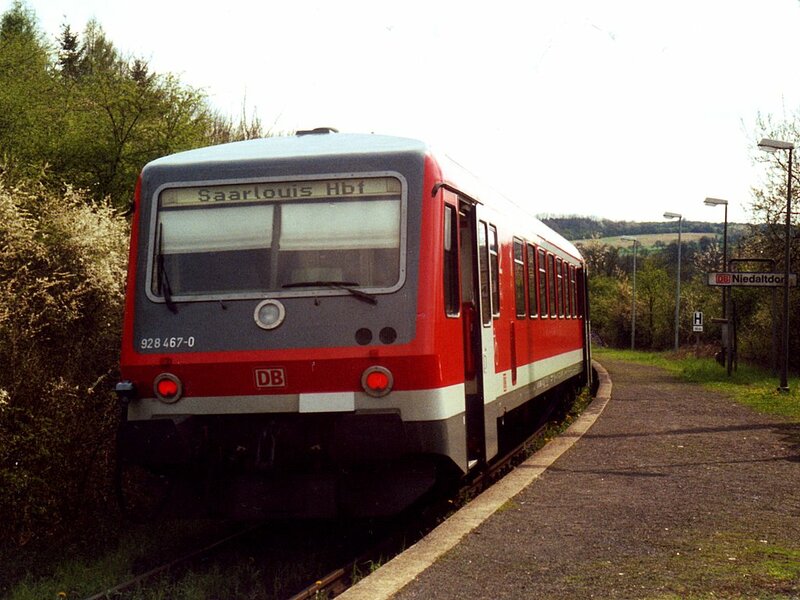 We took an SE down to Saarlouis to fill up some time and provide a second chance to do P1 at Dillingen which is on a loop accessible from the main line but separated from it by goods line. Definitely separate alignment once you’ve done it. Considerable irritation at finding that yesterday (Good Friday) DB were running through from Niedaltdorf to Bouzonville (France). Nothing to be done about it unfortunately, except perhaps to read news sources more carefully! Niedaltdorf is a pleasant enough rural branch, seemingly ending in the middle of nowhere. Extension of the service to Bouzonville would indeed seem sensible with all the infrastructure (at least to freight standards) already in existence. [but it's never happened, and now seems very unlikely]. Back to Saarlouis via Dillingen P1 again, ending up in P3 which although accessible from both ends, is only booked for use by Niedaltdorf trains. On to Saarbrücken where an hour gave us sufficient time to locate the Hotel Continental and conduct a lengthy debate about the price (partly my fault for not realising how little English was understood, as opposed to spoken). When ‘management’ who spoke good English arrived, it was all sorted amicably at DM109 (as opposed to 140). Back to the station for the 1710 to Sarrguemines, the only train that day. This line is still in the Saar valley and is pretty much run down outer suburbia all the way. It’s shared with the trams most of the way; these seem to have exclusive use of P1 at Sarrguemines. No French money, but enquiry revealed that the trilingual (DE, FR, UK) ticket machine was dual currency - ‘it’s a German machine, it ought to take German money’ quoth the helpful local. And so it did, converting at the fixed rate and giving change in French francs, a cheap way to get a few! 628 271 stands at the rebuilt station at Lebach-Jabach. As this was 2000 on a cloudy evening I was lucky to get even this photograph! Back on the tram, thus doing the other connection in Saarbrücken (rail to tram as opposed to rail to rail) and arriving at Saarbrücken Hbf in good time for 1829 to Homburg, an unexceptional main line trundle. At Homburg an horrendously graffiti’d two car push pull electric set was waiting. All windows on the south side were completely obscured making orientation difficult at some stations. This took us to Wemmetsweiler for 1930; the 1933 kart to Lebach arrived 2 minutes later and took us up an attractive semi rural branch as far as Lebach. The last 2km to Lebach-Jabach were very slow as though track condition was poor, although polished track continues beyond Lebach-Jabach, not as shown in Schweers & Wall. Money has been spent reconstructing the bus shelter ‘station’ at Lebach-Jabach so presumably it is not to close. 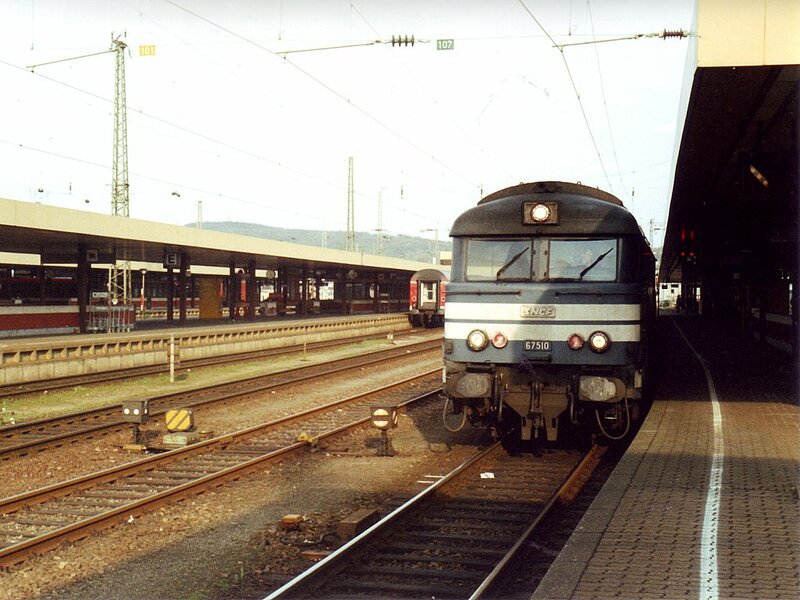 ight was failing on the return to Saarbrücken via Quierschied but with a clear view from the back cab and some light still remaining at Saarbrücken (2053), daylight was declared valid for the Wemmetsweiler - Saarbrücken section. We retired to Zum Stiefel in the very handsome pedestrianised old section of Saarbrücken for a really excellent meal accompanied by the house Märzenbier (sweetish, brown ale-ish, OK but not special) and the house pils (slightly lemony, sharp, refreshing, superb). A very good end to the day and with the track situation recovered the late finish (>2300 back at the hotel) was a small price to pay. Poor night with a duvet which seemed to throw itself on the floor every 10 minutes, but a better breakfast than expected. It was raining hard when we left at 0845 and we were surprised to find 3-5 cm of snow on some of the parked cars. 0901 to Landstuhl was an electric SE; pleasing to find the Küsel train booked out of P2 which is the main line (see later!). The Küsel train was an Adtranz low floor kart and ran briskly up to Küsel, which starts flat and boring but gets better. 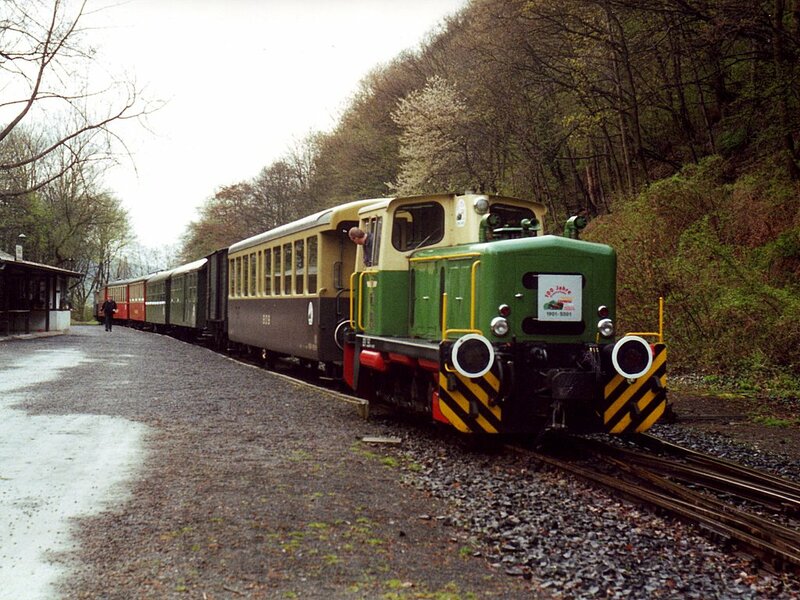 Draisines were in evidence at Altenglan, for use on the closed line to Lauterecken-Rumbach. At Küsel (raining hard, pub shut, no waiting room, kart trundled away up the line to wait) investigation revealed a bus to Lauterecken-Rumbach, so at the cost of DM15.60 and having to go back and do Kaiserslautern - Landstuhl some time, the bus option was taken. Lauterecken-Rumbach turned out to be a very smart station with the draisines on P3, a station gaststätte (open) and bus stop adjoining P1 where the kart for Kaiserslautern was waiting. The run down to Kaiserslautern isn’t all that interesting and I was glad not to have to do it both ways. A quick sandwich and beer stop at Kaiserslautern (which is being heavily rebuilt, with outside excursions required for west and east facing bays, both of which we used), before setting off to Bingen Hbf over previously done track. It was noted at Bad Kreuznach that the junction is west of the station. An SE was taken from Bingen to Koblenz - wedged as usual, with all sorts of nationalities amongst whom were a Kosovan mother and daughter who had all sorts of questions to ask including H’s age! Koblenz to Remagen was another SE, slightly less wedged but just as cosmopolitan. 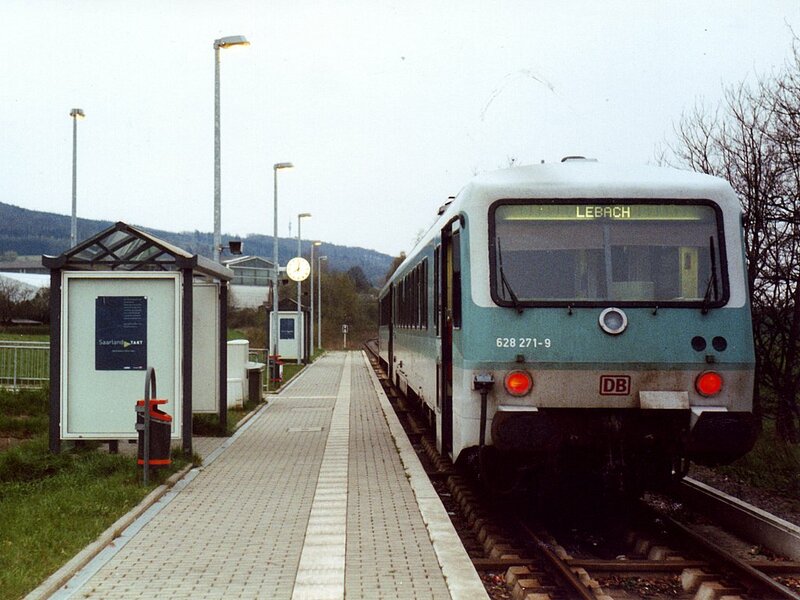 A 643 kart was waiting at Remagen to be the 1708 to Ahrbrück. The Ahr valley line isn’t perhaps quite what the Rough Guide would have you believe but it does get quite dramatic beyond Ahrweiler. It was a poor evening too, with frequent showers which didn’t do a lot for the view. Several British road coaches were parked up at Altenahr. We returned as far as Ahrweiler Markt, having noted on the way up that this rather than Ahrweiler is the one for the ‘old bit’. Very touristy but impressive old walled market town where we had a reasonable meal plus Ganser Kölsch, ably assisted in translation by a German/English speaking Belgian. We repaid his courtesy by telling him the English translation for spargel (asparagus). Final call was a (more entertaining though H was irritated by one of the customers) locals’ pub on a corner, with Ganser Kölsch again. We then retired to Koblenz where the Ibis is less than 5 minutes walk. Absolutely standard Ibis, and none the worse for that. Showered and breakfasted, we departed worryingly late for the station but there was no queue at the Reisezentrum (closed last night) and we made 0817 with ease. The haste of the loco crew to get the loco run round (it's there, in the far distance) was matched by my haste in getting to the hot food stall, so there was never going to be a decent picture of the smart station at Engeln! 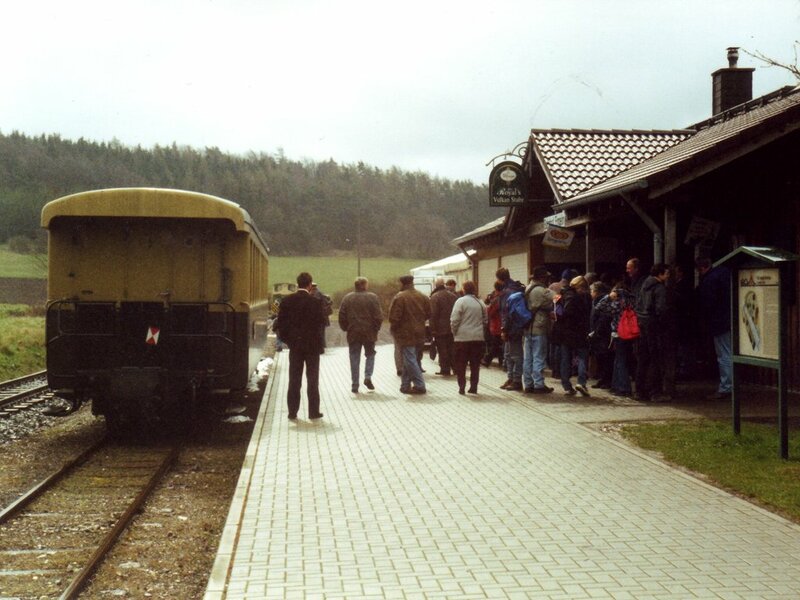 Disappointment at Brohl, where the NG station is right outside, as the kettle was broken so it was an all diesel day. We decided to go anyway, there being serious track to be done.A very pleasant trip up to Engeln, with two cousins (of each other, not us) intending to walk from Engeln to Oberzissen and catch the afternoon train back. Engeln had a thriving bar and bratwurst/hamburger operation so an early lunch was taken. On the return some shunting was done and the supposed 20 minutes break at Oberzissen disappeared. Arrival back at Brohl was just after 1241, which was the time of the next RE to Köln, but a stroll over to the station was rewarded as it came in just as we approached. A dash through the subway was just enough. At Köln we retired to Früh’s for a couple of Kölsches and (in my case) bread and cheese, for a not excessive price. On via Köln cathedral to Düsseldorf where there was insufficient time for a break, so we settled for the airport and a boring wait, followed by an uneventful Airbus back to BHX and a lift home from our son. Monthly ventures seemed to be getting a habit in 2001 and the next month I was off to Germany again, but this time taking in Denmark and Sweden briefly in order to fulfill a long held ambition of travelling on a train ferry.